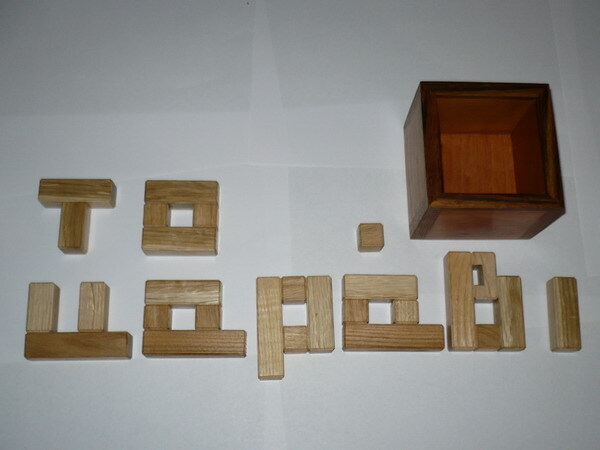 Pieces= Oak ,Elm.Box=Zebra,oak and iroco. this is a custom puzzle like previous puzzles eg. "Cube Elizabeth puzzle","Petros puzzle"... It was requested from the owner of a beach bar-restaurant. The name of the restaurant is "Karavi" so the puzzle is the Letters of this name (which means ''ship'' in greek) constructing a cube in a box. See more pics of the "to karavi" puzzle.or Back to puzzle index.